Avoiding performing recommended maintenance service can come with a hefty price tag. Here are four important steps you can take to protect your vehicle. First up is the simple oil change. 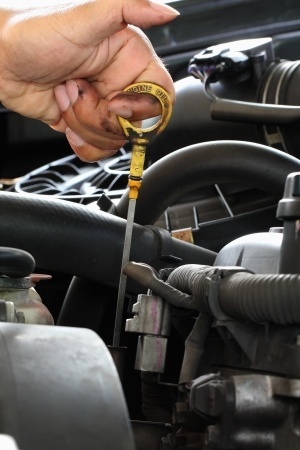 Bottom line – if you change your oil on schedule, your engine will be properly protected. Go past the recommended mileage interval, typically every 3,000 to 5,000 miles depending on driving conditions, and sludge begins to build up in your engine. This sludge can clog small oil passages that keep important parts of the engine from being cooled and lubricated. That is never good for your engine. If your engine has variable valve timing, as most do nowadays, or a turbocharger, then these expensive components are at high risk for failure and expensive replacement. If you’re not sure how often you should change your vehicle’s oil, contact our Service Advisor at Sparks Tire & Auto for our recommendation. Many vehicles come equipped with a timing belt. These belts wear out over time and must be replaced, along with the belt tensioner and other system components. If this belt breaks, you could end up with extensive engine damage that can cost thousands in repairs. Most manufacturers recommend changing the belt or chain every 60,000 to 100,00 miles, depending on the make, model and age of the vehicle. If you don’t know if your engine has a timing belt, as opposed to a timing chain, or when it should be replaced, ask us and we advise you of your vehicles recommended maintenance. More than half of all new vehicles sold have Gasoline Direct Injection (GDI) engines, which can be susceptible to extensive hard carbon buildup on the intake valves. Regular fuel system cleaning can keep the deposits in check, and improve fuel economy, performance, and emissions at the same time. Neglecting this important service for too long may require an engine teardown to media blast, or “sandblast,” the carbon deposits from the valves and cylinder head. And yep, that costs a lot. This last item may seem harmless, but it could have serious consequences: your vehicle’s Check Engine Light. Many of the troubles that can trigger a Check Engine Light are related to emissions. The light warns you when the engine is not running efficiently, due to unburned fuel and oil vapors accumulating in the exhaust system’s catalytic converter. When these accumulations get hot enough, they can burn up and damage the catalytic converter. The initial problem may be something as simple as a failed oxygen sensor or even an extremely dirty engine air filter. Ignoring that Check Engine Light could lead to some very expensive repairs. Set Up a Service Plan with Your Service Advisor at Sparks Tire & Auto in St. Charles, Mo. Performing recommended maintenance can prevent costly repairs. Ask a Service Advisor at Sparks about your recommended maintenance schedule and set up a plan to get caught up on any services you may have missed. Few things are more annoying than something happening that could have been easily prevented. Sound familiar? Here are three things that can happen to your vehicle that you can, and should, avoid. First, let’s talk about your tires. 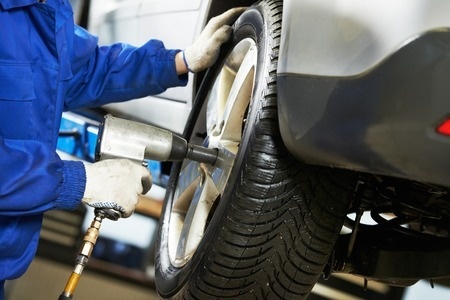 Tire problems, like a flat tire, usually come with a lot of hassle or expense and rarely occur in convenient locations like near our St. Charles, Missouri service center. There is usually a hassle or cost involved with taking care of a flat tire and failing a safety inspection because of worn tires is a bother. Get in the habit of checking your tires every month. Make sure they have the proper air pressure and look for excess or unusual wear. Rotating your tires on schedule and a routine alignment check will extend tire life. Of course, you always want to replace your tires before they become worn to that point that they are unsafe. Next up is your battery. Simply knowing how old it is can help you avoid being inconvenienced by a dead battery. Most batteries last about four years – after that, your battery is living on borrowed time. Many experts recommend that you replace your battery every five years as a routine maintenance item rather than waiting for it to fail. 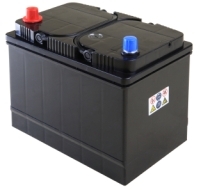 If you think your battery is older than three years, ask us to check it and gauge its health. Finally, let's talk about those little rock chips in your windshield. When the chip is small, it can be repaired and stabilized. If left unattended, the little chip can start to crack. When the crack is in the driver’s line of sight, it could impair vision. Some cracks can lead to a ticket or a failed safety inspection. That inexpensive rock chip repair looks pretty good compared to the cost and hassle of replacing a windshield. 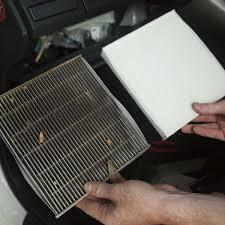 The cabin air filter is the filter responsible for filtering the air that is fed into your car or light truck's heating and air conditioning systems. The filter traps dust, pollen, and other foreign particles, preventing them from entering the vehicle and polluting the cabin. Since they work in essentially the same fashion as a regular engine air filter, cabin air filters get dirty and should be replaced when they become excessively contaminated, or at the regular service interval recommended by the manufacturer.